Your VIP Private Jet, which normally seats more than 40, has been custom-fitted for only 15 travelers with luxurious leather club seats and posh interiors. Your cabin crew will graciously anticipate all of your in-flight needs, while serving first class cuisine with fine wines and champagnes. Experience arrivals like royalty often at private terminals where you hardly realize the usual customs and immigration formalities have taken place. Luxembourg City, Luxembourg – UNESCO listed Old Town & Palais Grand-Ducal. Arrive in Luxembourg City where you are met and transferred to your centrally located luxury hotel. Meet your fellow travelers and tour manager at a welcome dinner party. Tour Luxembourg’s oldest quarter, called Grund, see the Fortress and Abbey of Neumünster. The old town is a labyrinth of history, listed as a UNESCO World Heritage Site. Take a full day excursion across the border to Trier, the oldest city in Germany on the banks of the Moselle River. Discover the largest and most well preserved Roman ruins north of the Alps. Board the Lakani Private Jet this morning and take a short flight to Bern, the capital city of Switzerland. Explore Bern’s picturesque historic city center (UNESCO listed) and the iconic medieval tower with its famous mechanical clock. 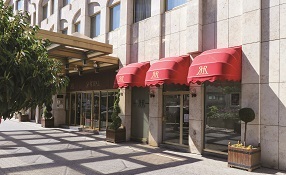 Later in the day, re-board the jet and continue to Belgrade, Serbia and transfer to your luxury accommodations. Explore Serbia’s capital city, located at the confluence of the Sava and Danube Rivers. Visit Belgrade Fortess encircled within Kalemegdan Park, and see its famous 17th century Clock Tower and historic Zindan Gate. Board the former Yugoslavia president Josip Tito’s famous Blue Train for a nostalgic ride to Novi Sad, Serbia’s second largest city and home to the Petrovaradin Fortress, continuously settled since Paleolithic times. Board the Lakani Private Jet this morning for your flight to Varna, the seaside resort on Bulgaria’s Black Sea Coast and enjoy lunch with a panoramic view of Varna Bay. In the afternoon, re-board the jet and continue to Yerevan the capital of Armenia. 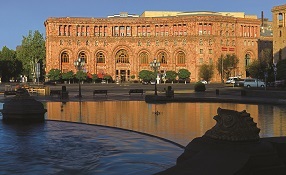 Tour the highlights of Yerevan, one of the world’s oldest continuously inhabited cities. Visit the Matenadaran, home to one of the world’s richest collections of medieval manuscripts and books. Take and excursions to the fascinating Geghard Monastery, partially carved out of rock in the Azat River Gorge. Travel to Etchmiadzin to see the Cathedral, the mother church of the Armenian Apostolic Church. Step inside the 7th century St. Hripsime Church found in the same city. Both structures are listed as UNESCO World Heritage Sites. Visit the Temple of Zvarnots, a majestic complex of ruins showcasing medieval Armenian architecture. Return to Yerevan and tour the Erebuni Fortress and Museum. Explore the works of famed Soviet Armenian film director Sergei Parajanov at his namesake museum in Yerevan. 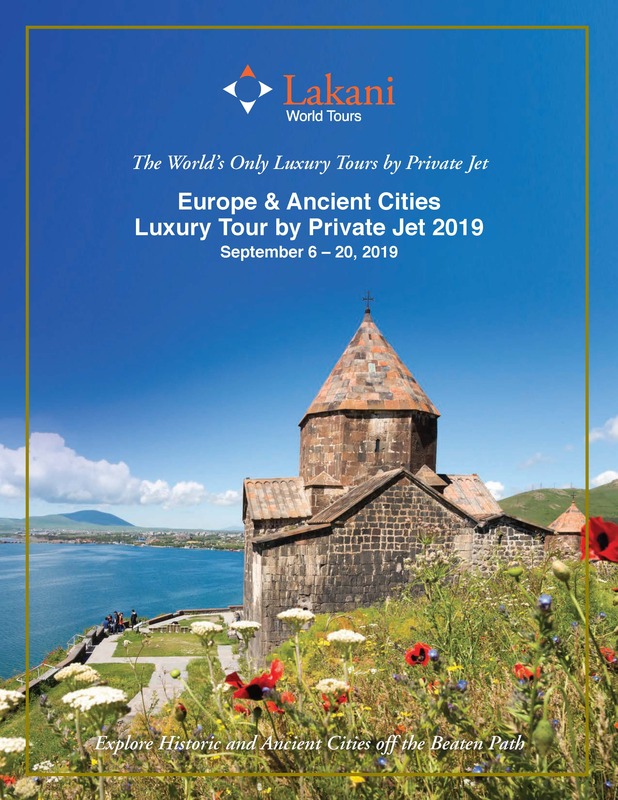 Bid farewell to Armenia as you climb aboard the Lakani Private Jet and depart for Aqaba. Enroute to Petra embark on an adventure in a 4×4 vehicle and follow the route of “Lawrence of Arabia” through the lunar-like landscape of Wadi Rum. Continue to Petra, also known as the Rose City. Walk through the Siq, a narrow chasm in the bedrock and gaze at the elaborate Treasury as you emerge. Admire the Nabataean rock-cut buildings with Hellenistic facades. If you are feeling adventurous, join your guide on the 1,000-step climb to the Monastery. 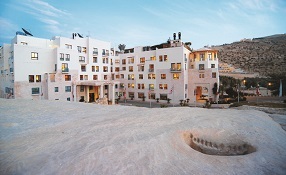 In the evening, enjoy a private celebration with local cuisine and Bedouin folk show. Board the Lakani Private Jet for your flight to Vienna, Austria. Join your guide on a morning walking tour of the Old Town. Visit the Schoenbrunn Palace and enjoy a private tour of the Bergl Rooms, among the most precious ensembles in the Palace. Attend an evening performances at the internationally renowned Vienna State Opera. On your last day in Vienna, attend a training session at the Spanish Riding School. In the evening, gather together with newfound friends and reminisce at a farewell cocktail and dinner party. Bid farewell to Austria and your private jet friends as you transfer to the airport for your flight home. Luxuriate in your elegantly appointed traditional Suite with view of the fascinating city in Luxembourg’s only five star hotel. Dine in La Pomme Cannelle, featureing a French gastronomic touch, or choose the brasserie, Amélys. Step outside the hotel and you’re close to elegant shopping, the City Art Museum, and the Grand Ducal Palace, as well as the UNESCO World Heritage Site of the Casemates du Bock. Relax in your well-appointed Junior Suite in this boutique luxury hotel with its antique furnishings. Ideally situated just steps from the Kalemegdan Fortress and Park, and the pedestrian shopping district, take a walk or browse the shops in your leisure time. Choose from European cuisine in the Square Restaurant or Japanese in the rooftop Ebisu Restaurant. Your Suite awaits you at this gracefully appointed luxury hotel, just steps from Republic Square. Sink into your comfortable bed for a blissful sleep. Choose from a selection of restaurants for breakfast – the Cristal Bar and Lounge, the Armenia Brasserie Restaurant, or the Meeting Point Outside Café. Add to that the Italian Cucina for lunch and dinner. Then burn off those calories in the outdoor pool, or take a walk around the famous square. Location, location, location! Enjoy your generous and elegant Suite in the luxury ﬁve-star hotel on the doorstep of the ancient city of Petra, one of the Seven New Wonders of the World. Your large balcony overlooks the swimming pool, which may be a welcome sight after a day in the Rose City. You have your choice of seven dining outlets – from casual to ﬁne cuisine – to suit all tastes. Whatever you choose, don’t miss an opportunity to watch the sunset over the Petra hills with a sundowner at the Al Ghadeer Roof Garden. 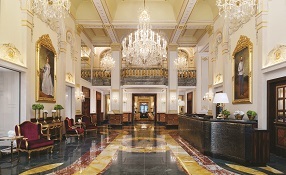 Indulge in Viennese splendor in your spacious Imperial Junior Suite in the historic ﬁve-star hotel whose prime location in the heart of Vienna has welcomed celebrities and royalty for almost 150 years. Your marble bathroom features a shower and bathtub and Bvlgari amenities. 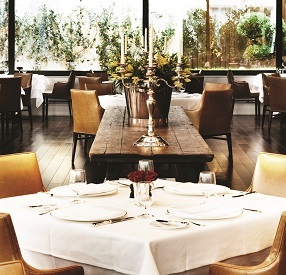 Try the landmark Restaurant OPUS for ﬁne dining inspired by Austrian cuisine. Or sample Viennese specialties at the legendary Café Imperial. With 24 hour room service, you may choose to dine in the comfort of your room. But don’t forget to bring home a famous Imperial Torte!